Linear type bottle filling machine has numerous applications in food & beverages, pharmaceutical, pesticides, distilleries, cosmetics, toiletries, personal care, chemical, oil, etc. 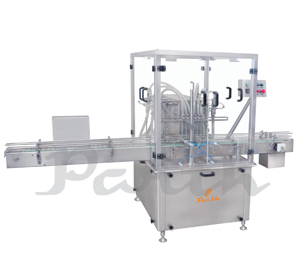 To serve the filling purpose in these industries we offer complete bottle filling line – different variants of the linear type-bottle filling machine. We supply automatic four, six and eight head volumetric liquid filling machine model and semi-automatic twin heads bottle volumetric liquid filling machine. The designed parameters of the bottle filler machine have been set up in order to achieve higher production rates. Our linear bottle filling machines are incorporated with twin pneumatically operated stopper system in order to reduce the wastage thus making the entire process a cost-effective one. The filling machinery for bottle has a sturdy structure built with industrially graded raw materials making it durable and suitable to be used for a longer period of time.